Central Baptist has a Portuguese speaking sister congregation, IBC. They’ve been part of our family for almost two years, and have brought an brilliant energy to our fellowship. It’s amazing to encounter how our different cultures tend to work, and how we compliment one another in many ways. One area in which our Brazilian family-members shine is in decorating. When IBC throws a party they do not mess around. 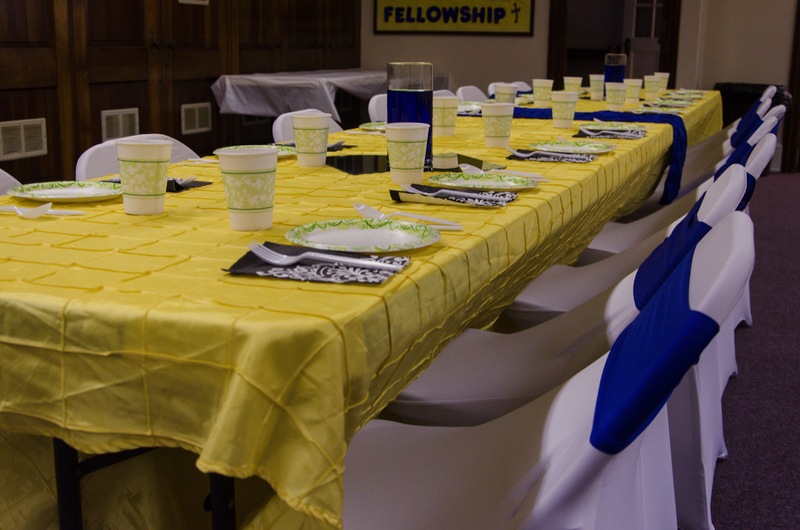 Several members work in catering, and have a host of linens and chair covers which transform old metal chair and drab plastic tables into something rivaling an expensive catering hall. I’ve seen some IBC members construct temporary backdrops for celebrations with the same care a person might build a house. It’s amazing to watch unfold 1. IBC’s skill and generosity is so great they’ve offered to decorate for any celebrations Central has. We’ve not often taken our sisters and brothers up on the offer, because we don’t want to take advantage, but when we have asked for help they’ve always responded and done a terrific job. As seen in the photo below. Tonight is our third annual Chili Cook Off, benefitting Baptist Camp Lebanon, and IBC decorated the room. Please note, the plastic utensils and paper plates and cups are all American additions. If you’re looking for something to do on May 13, and are in the Philly area, please consider stopping by and eating some chili.